Children's brains, on the other hand, are hard-wired to let them pick up languages with ease. 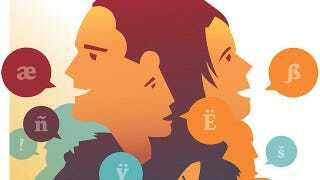 Plus, a new study finds that even adult brains can re-wire themselves to mimic the brain patterns of native speakers – and this effect is amplified if they study by immersing themselves in a foreign language, rather than sitting in a classroom. And when they were not exposed to the new language for five months, their native-speaker brain patterns actually got stronger. The new finding contrasts with previous studies, which indicated that similar levels of language learning could be achieved by both studying grammar rules in a classroom setting, or "explicit training," and immersion in the language, or "implicit training," defined as "training that engages…learners with the target language but does not provide any explicit information or direction to search for rules." But these studies failed to examine students' brains. Researchers from Georgetown University Medical Center and the University of Illinois – Chicago used an artificial 13-word language, Brocanto2, to describe a computer game. While the artificial language's small vocabulary allowed subjects to learn it fairly quickly, its grammar was relatively sophisticated, mimicking the rules of Romance languages while diverging from the participants' native English grammar. Next, the researchers separated 41 adults, who spoke only English, into two groups at random. One would study Brocanto2 through explicit, and the other through implicit, training. To standardize the brain scans, the participants all had to be right handed. After studying and practicing the artificial language, the subjects listened to Brocanto2 sentences that were either correct or contained grammatical errors, and they had to press buttons to indicate whether the sentences were "good" or "bad." While participants underwent testing, EEG electrodes monitored the electrical activity on their scalps, which allowed the researchers to build a picture of their brain activity. While both groups achieved similar proficiency in the artificial language, their brains weren't as evenly matched. Only the brains in the immersion training group processed language like native speakers' brains would. And even after five months of zero exposure to Brocanto2, the brain patterns in both groups only became more similar to those of native speakers. "The results demonstrate that substantial periods with no [language] exposure are not necessarily detrimental. Rather, benefits may ensue from such periods of time even when there is no [language] exposure. Interestingly, both before and after the delay the implicitly trained group showed more native-like processing than the explicitly trained group, indicating that type of training also affects the attainment of nativelike processing in the brain." Top image by Tobias Mikkelsen.